By the Outlook PST Recovery Tool, users can repair PST file attribute such as emails, tasks, calendars, notes, etc. which are corrupted. Even the hard deleted PST files have a way to be recovered by this outstanding tool. 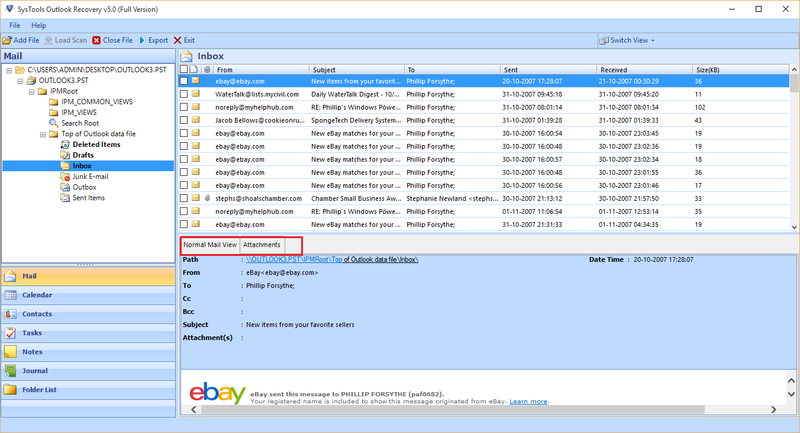 Advance Mode is to be used to recover the deleted PST email files. Outlook Recovery software has the potential to recover damaged PST files after performing a quick scan on them. 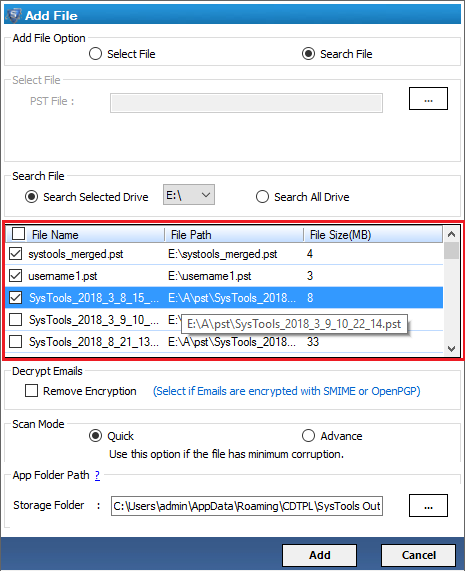 After scan, files are previewed in a list but if the outlook files are severely damaged then, user should opt for the Advanced Scan mode option. The PST Repair Software after performing pst recovery, saves the Outlook PST data into different file formats like EML, MSG and Office 365. Saving MS Outlook files in EML or MSG file format will let users open and read PST email files in Windows Live Mail & Microsoft Outlook respectively. The Outook recovery tool is adept in recovering Outlook PST files with a lot of ease and previews all the email files after scanning gets completed. It lists all the email files along with the linked attachments in an in-built viewer. All other Outlook PST items that are recovered can also be previewed. Using the Split resultant pst option of this tool, users can even divide a large sized PST file into small fragments to avoid PST corruption so as to repair Outlook files. User can choose any file size from 1 to 45 GB and create a PST of same size, which eventually will be easier to manage. 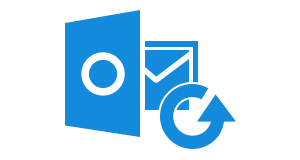 PST file recovery by this Outlook Recovery Tool allows users to save PST files as EML, MSG and Office 365. User can select any of these naming conventions to save Outlook files and to enhance the manageability for users. User can specify a date range to apply filter on PST emails so as to perform selective PST file recovery in the specified date range and not the whole Outlook recovery. 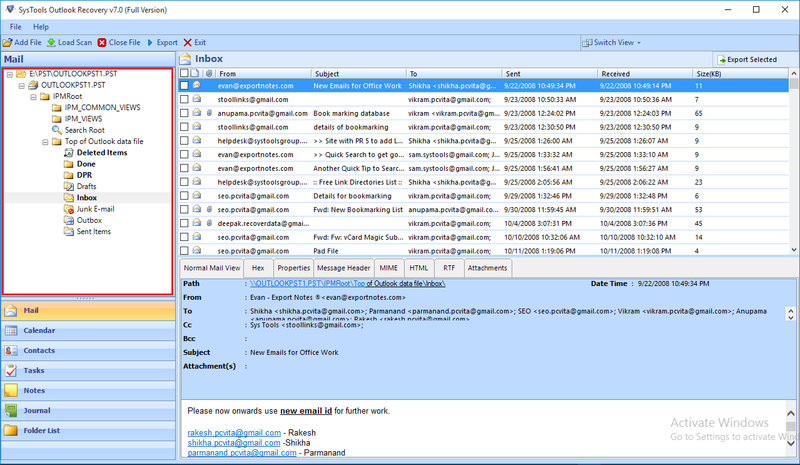 In this way, email filters are applied on the recovered Outlook PST email files. After all the data items are successfully recovery, PST Repair Tool produces an recovery process report along with the location of migrated file of selected mailbox. 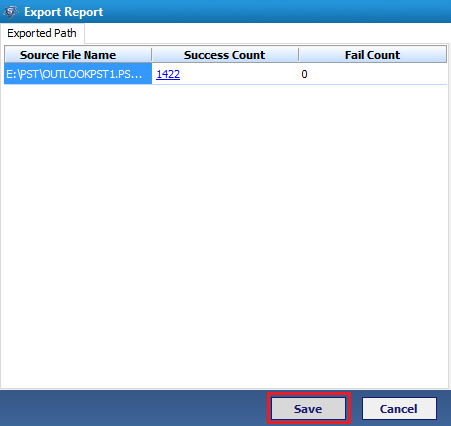 User is also given an option to save the report of repaired PST items as a CSV file for further future purposes. Is it possible to recover Outlook files of ANSI file type by this tool? Yes, the Outlook Repair Tool can recover ANSI and UNICODE PST files both. 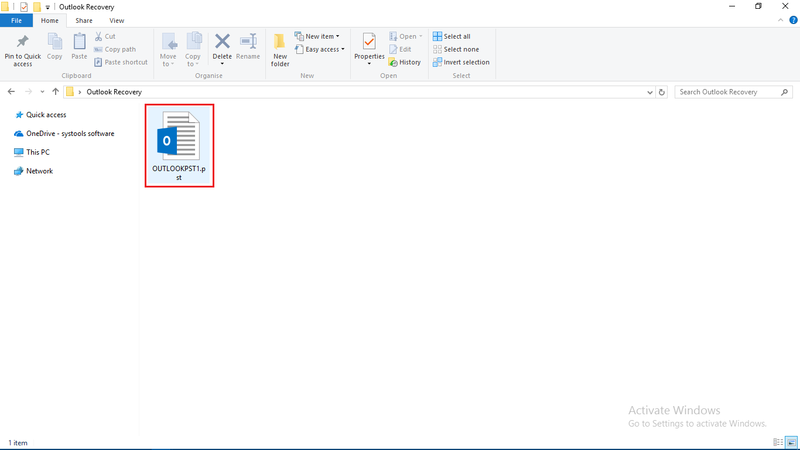 Can you tell me what will be the file format of recovered Outlook files by this tool? The file format of PST data will be UNICODE and you can view it in all MS Outlook 2003 and above versions in case you have repaired and converted the Outlook files into PST format by the help of Outlook file recovery utility. Is there any file size limitation on recovery of Outlook files? No, user can recover corrupted PST files data of any size without any restriction. Is it possible to recover deleted PST files emails by this PST recovery tool? Yes, the deleted emails can be recover along with all attributes by using this Microsoft Outlook PST recovery software. Is Outlook installation necessary to repair Outlook PST files on my system? 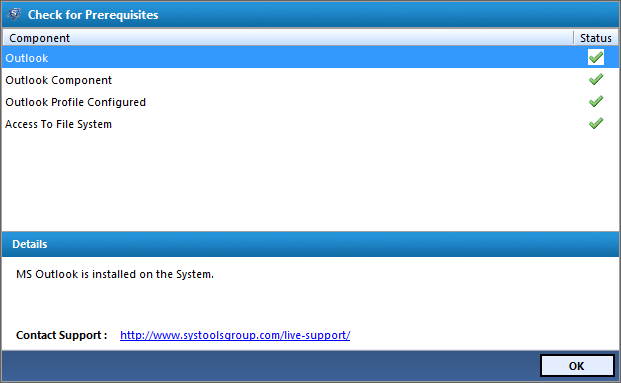 No, Outlook installation is not necessary to recover corrupted and damaged PST files by this tool. Download and launch Outlook Recovery software on the system. Firstly, it will check pre-requisites for working of the software. 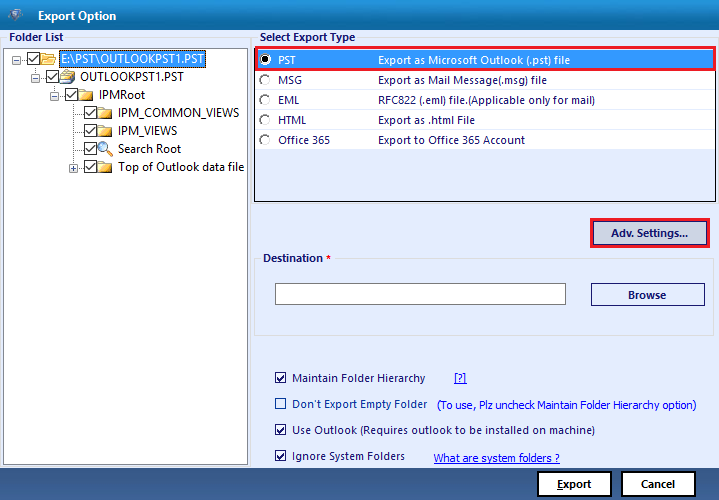 Then, click on Add option and begin the process of adding Outlook PST files to the software. 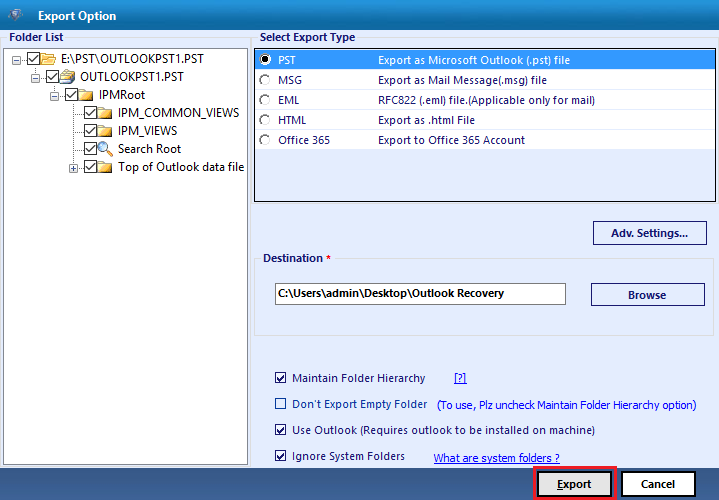 Click on Browse option and define the path of Outlook files that will be used for loading into PST recovery tool. Now, all the PST folders will be previewed along with the attachments in a proper hierarchy of folders. After selection PST radio button click on Advance Setting as shown below. Now the Advance Setting window will appear simply select the option like PST Split Option, Date Filter Option, Categories and hit on Save. Now Provide destination location to save result by clicking on Browse button. At the end click on Export button to start recovery process. An export report will be displayed on the software screen. Click on Save option to save the CSV report. 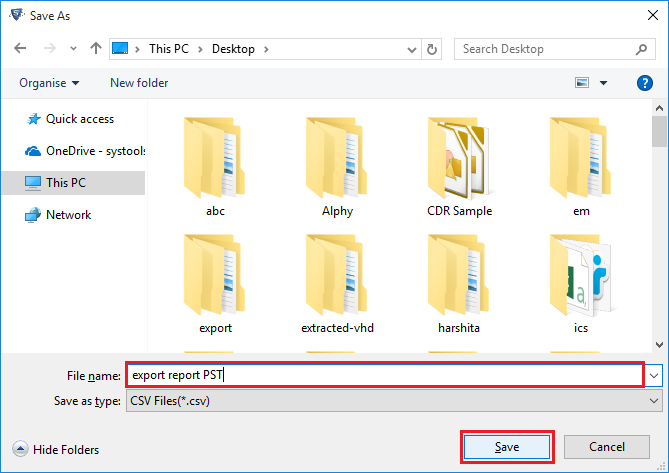 Browse and set the destination of output files and click on Save option to save recovered Outlook data. Now, open the resultant files and View complete data easily. "My Outlook PST file was almost damaged and I was just not able to access my PST files. 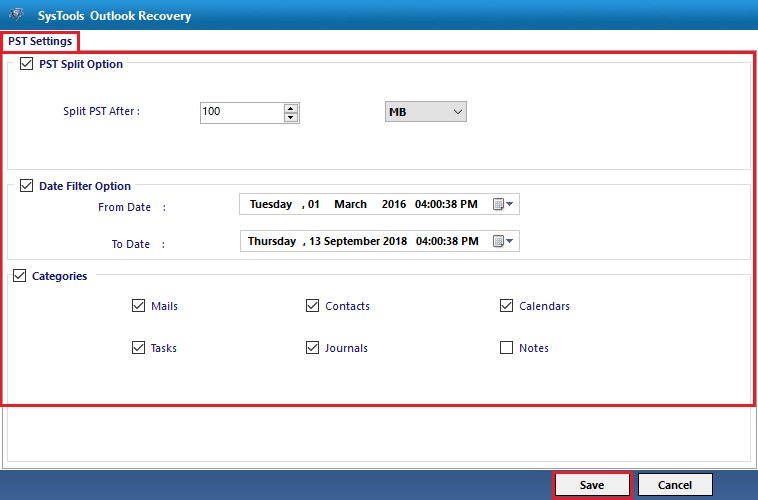 Then my colleague suggested me this PST Recovery software and he enlightened me about its awesome features. And I have found that it actually works in just the same manner as he told me. Outlook PST repair tool has saved my files from getting into disaster. A bunch of Thanks to the team!" "PST Repair Software is the only dependable name which can extract you out from the worst of worst situations, especially in case you have lost complete Outlook data due to a file corruption issue. 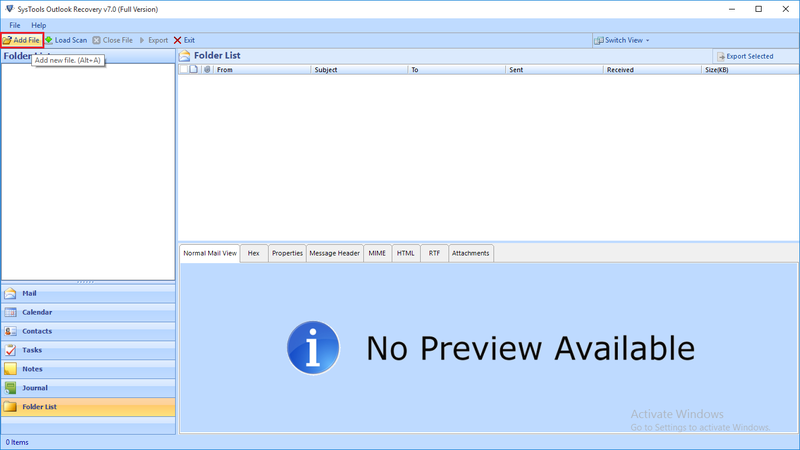 This Outlook PST recovery tool not just recovered PST files but also provided me with some exciting options to secure my Outlook data for future purposes. Thanks a ton guys!"